Pwin Tuntasood, CFA, Vice President, is a Fixed Income Product Strategist within BlackRock's Global Fixed Income group, based in New York. 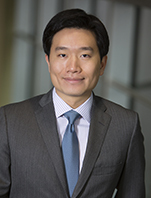 He is responsible for representing Fixed Income iShares (ETFs) by providing market and product insight across client groups. Previously, Mr. Tuntasood was a senior product strategist focusing on BlackRock's active inflation-linked bond and multi-sector teams. Prior to joining BlackRock in 2012, Mr. Tuntasood was a member of the Global COO Office at Deutsche Asset Management, where he began his career as a mutual fund product specialist.